The first two installments of the Lean Forward Files touched on several topics, including government job creation. 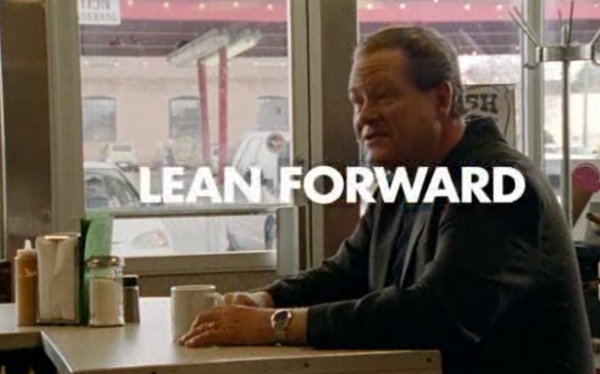 Just as a reminder, the “Lean Forward” advertising campaign is an attempt by MSNBC to brand itself as the network “for progressives.” While many of the individual commercials in the campaign are harmless or silly enough to dismiss with only a few words, a few of the commercials require a more thorough examination. In this volume of the Lean Forward Files, we will examine some of the “Occupy” rhetoric that appears in one of the commercials. Ed Schultz, the host of MSNBC’s The Ed Show, appears in a commercial set in a classic American small-town diner, insisting that Wall Street is “going through the roof” while Main Street is “paying all the bills.” He adds that “all the money's flowing to the top, all the control is flowing to the top, all the tax breaks are flowing to the top, and they wanna know why America is upset!” It’s not a surprise to hear this rhetoric from Schultz, who is well-known for stoking populist anger over the plight of the working class. This is largely the same story as the one told by the “Occupy” movement. Wall Street is succeeding while the rest of America suffers, and the rich have all of the money and power. This commercial predates the start of “Occupy Wall Street”, but the similarities are striking. The question is, is there anything to this? Do they have a point? Actually, yes. After all, Wall Street did get bailed out with taxpayer dollars under the Bush and Obama administrations. Could the Troubled Asset Relief Program, better known as TARP, be considered anything other than corporate welfare? Who could forget the “golden parachutes” for Goldman Sachs executives? With the exception of Ford Motor Company, the domestic automotive industry also received a taxpayer-funded bailout. FreedomWorks has consistently fought against corporate welfare, regardless of the party in power. So, if both sides are against corporate welfare, where is the divide between Ed Schultz, “Occupy”, and FreedomWorks? In other words, we’ll end up with corporate overlords in both the economic and political spheres if the people’s government is not strengthened. The argument goes that a small, limited government has little hope of contending with the money and power wielded by corporate titans. Government must have the power to regulate business as extensively as necessary in order to protect the public interest, even to the point of nationalizing industries. Ed Schultz and the “Occupy” protesters see the recent examples of massive corporate welfare as an indication that government is still too small and weak to resist the demands of big business. So, what’s the FreedomWorks solution? It’s difficult, even impossible, to deny that big business wields enormous influence over our federal government. The answer, as is so often the case, rests with the Constitution. Even a brief reading of the Constitution reveals that the recent, massive government intervention into the economy and into business has little to no constitutional basis. Those congressmen who supported the bailouts and other forms of corporate welfare have feebly pointed to Congress’s power to regulate interstate commerce to defend their actions. They also refer to the “general welfare” clause of the Constitution. Does propping up big business count as regulating commerce? Did bailing out the automotive industry provide for the general welfare, or just that of General Motors and Chrysler? If corporate welfare doesn’t have a firm foundation in the Constitution, why is it happening? There are two main reasons. Most importantly, those in power have lost their respect for the supreme law of the land. The Constitution still receives a fair amount of lip service, but few consistently adhere to it. This is a fundamental problem that infects all of the political issues confronting America, and which can only be addressed through a revival of widespread public support for our founding document. “Parchment barriers,” as James Madison would say, are ultimately insufficient to limit government and to protect our liberties. The people must hold our representatives accountable to the Constitution. The second reason for corporate welfare is deeply intertwined with the first. Simply put, by straying so far from our limited, constitutional government, we have created a leviathan. We have an enormous government and it only grows larger by the hour. The tentacles of big government reach into almost every nook and cranny of our lives. Business is heavily taxed, subsidized, and regulated. We regularly try to pick winners and losers in the economy, with Solyndra only the most recent example. With government so involved with business, is it really shocking that business involves itself with government? Most businesses lobby government and try to get certain candidates elected because they know that if they’re not at the table when the legislation affecting them is being drafted, their competitors will be. Once you establish the principle that government can pick winners and losers in the market, businesses will shift substantial resources to lobbying the government to favor them, in a process that economists call “rent-seeking.” It’s a process that wastes resources, limits market efficiency, and reduces prosperity. If we restore government to its limited role in the economy under the Constitution, businesses will lose the incentive to participate in rent-seeking. Why would General Electric spend millions of dollars lobbying the government and getting handpicked candidates elected if the government isn’t handing out billions in bailouts, picking winners and losers in the economy, and regulating industries into the ground? What’s the incentive? Ed Schultz and the “Occupy” movement actually have identified a major problem with the way our federal government is operating. FreedomWorks agrees that corporate welfare and crony capitalism must be stopped. However, Schultz and the “Occupy” movement claim that the only way to do it is to increase the size of government, while FreedomWorks believes that that would only exacerbate the problem by increasing the incentive for businesses to do rent-seeking. Fine, Monty, why don't we get rid of the Constitution altogether and just let the Obama administration do whatever "appears to be a really, really good move"? We could start by doing away with that pesky "do nothing" Congress. Same with the Supreme Court--I mean why risk them overruling Dear Leader's mandates? Oh, and we'd have to gut Article II, as well, or someone might have the effrontery to insist on holding another election for President or, gasp, even to try to remove Obama through impeachment and conviction (a difficult proposition, to be sure, without a Congress, but why take chances?). I could go on, but why bother. I mean, it's not like our elected representatives actually took an oath to uphold the Constitution or anything. I am reminded of John Stossel using a chainsaw to the 2700 pages of Obamacare. Then we could throw in the Tax Code, over 50,000 pages. Or maybe Dodd Frank, over 2300 pages. All this paper printed up as we dance around the Constitution. I guess the little pocket sized Declaration of Independence and U.S. Constitution which I carry is too small to matter; only 46 pages. The Glass-Steagall act of 1932 stood us in good stead for 67 years, only 20 pages. We repealed it, then passed Sarbanes Oxley and then Dodd Frank. Yes, as Pogo told us many years ago; "We have met the enemy and he is us." I was really enjoying the logic in your post, right up until you started in on the constitution. Then when you attempted to use the constitution to downplay the bailout of the auto makers, it got really more interesting. So let's look at your idea first by leaving out the mumbo-jumbo of the constitution. Just for a bit and then you can go back to it. So you seem to be thinking that the auto company bailouts benefitted only the corps. Well actually, the bailout saved thousands of jobs and turned out to be a huge success. And the money was paid back too! Anyway, let's return to the constitution now. It seems you are suggesting that it should have never happened because of the 'constitution'. That sort of leads me to think that maybe the constitution is getting in the way these days. These 21st. century days that is. I guess it all boils down to a question of whether we should use your interpretations on the 'constitution' or do what appears to be a really, really good move by the Obama admin. Whatta ya think? Does the constitution have anything to say about the earth being flat? Or is that just the bible? I mean, if we can sort of acknowledge that the earth is round and it's billions of years old, maybe it's safe to deviate a little fromt the constitution too? Like as if deviating from the bible isn't bad enough! Get it? The Lean Forward Files: Who Pays For Government Jobs? The Lean Forward Files: “Our Differences Are What Unite Us”? Huh?